Original moon walker Buzz Aldrin will once again dance live on television Monday night on "Dancing With the Stars." 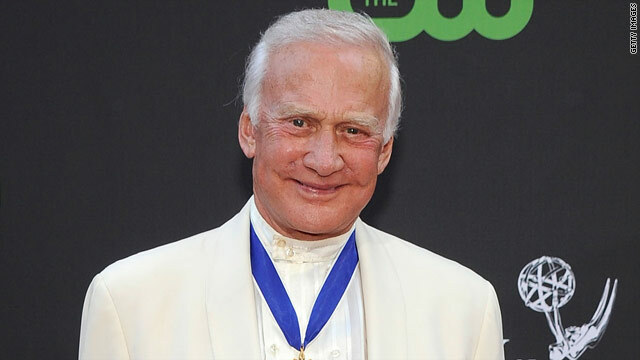 Buzz Aldrin will perform live on Monday night's "Dancing With the Stars"
Los Angeles, California (CNN) -- When Buzz Aldrin danced on the moon 40 years ago, an estimated 600 million people watched it live. The Apollo 11 astronaut will dance again on live television Monday night as a contestant on ABC's "Dancing With the Stars." "When I prance out there with the cha-cha step, I've got to be filled with far more confidence than I was when we began to land on the moon," Aldrin told CNN before Friday's rehearsal. Aldrin, partnered with Ashly Costa, is the oldest dancer on the show. Looking younger than his 80 years, Aldrin boasts a full head of silver hair and an energetic and athletic physique. He stays fit walking through airports to catch flights and climbing the stairs in the 23-floor Beverly Hills condo building where he lives with his wife, Lois. She keeps him on a healthy diet, he said. The second man to step on the moon still lives life at full speed, attending Hollywood red-carpet events and traveling to promote his project to improve science, technology, engineering and math instruction in schools. "If I'm going to talk about what our future ought to be, I've got to stay current," he said, demonstrating the Buzz Aldrin iPhone app, just released through iTunes. When "Dancing With the Stars" called, Aldrin saw it as a way to draw attention to his two books for children and his autobiography, "Magnificent Desolation: Walking on the Moon." Aldrin's first moon dance was a kangaroo hop that he did near the end of his two-and-a-half hours outside the lunar module on July 21, 1969. "I got in front of the camera and I just started prancing around with a kangaroo hop, not too good for moving around either on the moon or here," he said. "It turns out that something like a horse gallop, where you put one foot down, then the other, is pretty darn effective, because low gravity and the space suit make everything seem like in slow motion." The moon "wouldn't be a good place to do the cha-cha," his first dance on the ABC show, Aldrin said. "That's too fast-moving for lunar gravity." Aldrin and Costa have had two weeks to rehearse the cha-cha in Earth's gravity. "It's a fast-moving, lots of twists and turns and changes of direction and quick movements, but Ashly and I will experiment a little bit with when I should stick my arm out there like that and when it's on my hip," he said. "Everything has got to be snappy and precise for the cha-cha." Aldrin is already looking down the road to dancing the foxtrot. "It's up and down and really smoothly moving around," he said, swaying. "And we do some pretty special things. I get to kick my leg a little bit, too." Dance is not his only show biz venture. Music producer Quincy Jones recently persuaded Aldrin to work with rapper Snoop Dogg. The result was "The Rocket Experience," a rap song and video aimed at inspiring young people to reach for the stars.